Happy Spring, sweet friends! Can you believe Easter is just around the corner? My how the time flies! However, not to worry…this week I am joining my tablescaping friends to bring you our Easter tables. This fun tour is being hosted by the wonderful and talented Chloe at Celebrate and Decorate. You will find a schedule of this week’s participants at the end of this post. My newly acquired Staffordshire bunnies and pretty chintz table linens became the theme for my Easter table. The bunnies were purchased at an estate sale last fall, and I have been anxiously waiting to display them in my spring decor. Several years ago, I found these plates at HomeGoods. They are by Andrea by Sadek and are a reproduction of a late 18th century Chinese export porcelain collected by Harold S. Vanderbilt. Pickings were slim at my local grocery store for spring flowers. I chose to go with one type of flower…raspberry colored alstroemeria. The color picks up the same floral shade in the chintz table linens. I love alstroemeria for its longevity. Each napkin is tied with a pearl napkin ring. Thank you so much for your visits and comments. Lately, I have been absent and for that I want to apologize. Sometimes, family life can get a little hectic. I promise to post more. In fact, I have three posts ready to go. Later this week, I will be sharing my entry adorned for spring. It is one of my favorite areas to add seasonal touches. Next week, I will show you some updates to the living room, and I will be joining some of my blogging friends to bring you our spring home tours. This week, please be sure to visit my tablescaping friends. Their endless talent always inspires me. I know you will be greeted with lots of gorgeous inspiration for your holiday tables. May you all have a very happy and blessed day, friends! Hi Shannon!…happy to see you!….Oh those new Staffordshire bunnies are the cutest and how they set the tone for your beautiful table!…What a great find at HG’s of those gorgeous plates! A beautifully curated table for Spring and Easter! Looking forward to your upcoming posts!!! Dear Shannon, your table is lovely. I am in love with your Staffordshire bunnies and those plates are gorgeous and were certainly a find. I have missed you and your lovely posts. Hope this finds you enjoying spring days. Looking forward to your posts this week. Such a pretty and festive table! I love those bunnies! Shannon, I have missed your beautiful posts. The Staffordshire bunnies are the perfect choice for your Easter table. I love how the bunnies and alstroemeria work so well with your Andrea plates. I also love your choice of linens, they are so pretty! 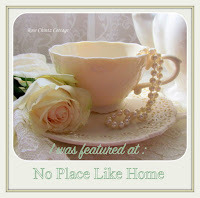 It is always a pleasure to blog hop with you sweet friend! Happy Monday! Shannon, what a richly layered table — I so envy your skill at mixing patterns so successfully! Those HG plates I would have sworn were vintage like the wonderful rabbit finds. Love your Staffordshire bunnies gathered around your pretty Easter table Shannon. The colors are bright and beautiful. Welcome to Easter table hopping and hope all is well with family. I, too, have been having things happen that get in the way of consistent blogging. That tis life. Shannon, You have a knack for mixing and layering so beautifully. I think the solid color Alstroemeria was the perfect choice for this table. They let your newly acquired bunnies be the star. Your plates are gorgeous and your linens complement so well. Beautifully done. I understand perfectly about life and blogging. I would be voted the least consistent blogger! Love your bunnies! The table looks perfect for Easter. Shannon, I’m just loving your Andrea plates! Blue and white is so classic, and they have the added touch of color with the floral motif. Your cranberry alstroemeria bouquet coordinates so well with the plates, tablecloth and bunnies. What a great estate sale score you got with those bunnies! They are perfect for your Easter table. It’s always a pleasure hopping with you! Happy Easter! Shannon, I love your bunnies. I didn’t know that there were Stratfordshire bunnies. They are perfect with the dishes. The raspberry flowers are just the right color to compliment the bunnies, the plates and the linens. You’re a great one to start off the Easter blog hop. I cannot believe it, but I have the same exact bunnies! They are truly one of my most treasured in my Staffordshire collection. I love your tablescape, it is gorgeous! Shannon, I really enjoy how you mix your patterns in this tablescape. You picked up on the colors so beautifully too and your pieces look so gorgeous together. Your “floppy-ear” Staffordshire bunnies are such a classic as well as the pearl napkin rings. The burgundy colors really come through in contrast to the cobalt blue. Such elegance to this table. So beautifully done. This is gorgeous Shannon, your bunnies are totally delightful! The alstromeria bring the bunnies and the beautiful china together perfectly! Your table is simply elegant and a refreshing interpretation of Easter, so lovely! What a beautiful table, Shannon! I would adore spending time with you there…it’s just lovely. You always set the prettiest tables…thank you for all the inspiration! This is just so beautiful! Such a joy to visit with you today! I love your use of vibrant color for an Easter table! I have learned to not be afraid to mix patterns from you and other great decorating bloggers. Looking forward to your next spring table! Love your Peter Cottontails. What a pleasure to see your lovely blue and white table. The Andrea plates are so pretty. The plate stack is so beautiful on your table. I love how you mix and match and layer. A pleasure to see your inspiring table. Your Staffordshire bunnies are beautiful. What a treasure you have and how well you have styled your table to complement the bunnies is amazing. The napkins, your dinner plates and the alstroemeria all coordinate perfectly. I am so glad you were able to share your pretty bunnies with us! Thanks for joining another hop! Shannon, I am smitten with your Staffordshire bunnies and love the cream and raspberry palette of your table and the pearl napkins rings are such a beautiful and classic addition. So fun hopping with you – Happy Easter! The bunnies are so unique and they blend perfectly with the linens. Beautiful work Shannon and have a Happy Easter. Gorgeous! I especially love the stemware!! Hugs! Shannon, I love your table! It is layered so beautifully. Those bunnies are adorable! So happy to be on this blog hop with you! Simply beautiful! I love the bunnies! I think I would keep them out all the way through summer! Your table is delightful. I always love your pretty tablescapes!